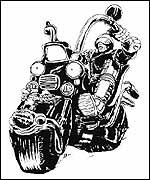 Prior to my review of the first of the Judge Dredd Case Files, I thought it would be nice to look at some of the original concept art, devised by Carlos Ezquerra. He had the whole design nailed, didn't he? That sketch with Dredd on the Lawmaster looks amazing - and it is interesting to note that the helmet that the Judge is wearing is more like a motorbike helmet, with visor. In the second picture, the helmet looks more like another of Ezquerra's character designs - that of Johnny Alpha, Strontium Dog. The final design shown here is the blueprint for Dredd.